Def Leppard came out to play. The crowd welcomed the five British lads from Sheffield with a roar as they started into their latest single Undefeated. Likely little known accept to the diehard fans who own their latest live release Mirror Ball Live and More, the audience was still appreciative. Then Def Leppard ripped into, one of the best, Let’s Get Rocked, and the greatest hits rock and roll show began. Animal and Foolin’ quickly followed with more fan appreciation and participation. These two songs have never been in my Def Leppard top ten, but upon hearing them live for the first time, I gained a new appreciation for their arena rock vitality. Perennial favorite Love Bites followed to great applause. Then the spotlight turned to bassist Rick Savage for a solo which turned into a heavy metal cover of the David Essex classic Rock On. The crowd didn’t catch on immediately, but with memorable lyric, “Still looking for that blue jean, baby queen, Prettiest girl I ever seen, See her shake on the movie screen, Jimmy Dean,” they soon joined in. And it was a perfect segue to Rocket, another favorite, where Def Leppard gives their own homage to their influences within the lyrics. And, of course, the fans echoed the chorus. The band shifted into acoustic mode, and encouraged the crowd to ‘be in the band’ by singing along to Two Steps Behind and the first half of Bringin’ on the Heartbreak. The crowd needed little prodding from vocalist Joe Elliot to join in. This time was also one of the more humorous moments as Elliot cursed the flying insects, mosquitoes, that were pestering the band from the start. “It’s hard to sing when you’re gritting your teeth. Mostly, I must try not to swallow,” he said in the Queen’s English. While Joe Elliot continued the chorus on acoustic guitar, the remainder of the band returned to positions and then made Bringin’ on the Heartbreak electric. Of course, the mammoth instrumental Switch 625 followed, reminding again that Def Leppard can still deal blistering, twin guitar, melodic heavy metal. Def Leppard turns to two favorites, Hysteria and Armageddon It, to crank up the crowd once more. Once more, the fans respond with enthusiastic recitation of both lyrics and chorus. But it was the opening chords of the classic Photograph that produced a roar more auspicious than the start. More applause, screams and singing along ensued. Pour Some Sugar on Me followed, and the crowd was in full blown frenzy. This song would close out the ‘defined’ set list, at least for a minor intermission. As band returns for it’s encore, and Joe Elliot, with a drink in hand, begins to thank the crowd for their appearance. Raising the cup, he notes that tonic water, also known as quinine, was used by the English soldiers in India to ward of pesky flying insects. “Although mine is probably seven parts vodka and one part quinine.” The crowd applauds at his exaggeration (or not). The classic anthem Rock of Ages sends the enthusiastic Def Leppard fans home with a night of fine entertainment and grand memories. This indeed was a rock and roll show. Between musicianship and stage presence, lights and video, this was an entertaining spectacle. 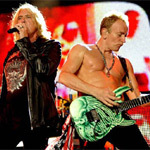 Def Leppard is a great band with talented players performing great songs. Ultimately, tonight, they were rock entertainers, bringing the music and show to their fans with excitement and proven professionalism. You could actually stop reading with that last paragraph. But here are few additional observations concerning other elements of the concert. Concerning sound, overall, it was adequate to quite good. However, the bottom end of drums and bass was very heavy, very intense, and sometimes the high cracked and crackled. From our seats, our view of stage, and specifically drummer Rick Allen, was almost entirely blocked by scaffolding and speaker columns. However, I don’t think much, other than moving to the floor, would have made an difference. Once you concentrated on the show, it was less of an irritation. Still, like the Journey show three years ago, a video screen on either side of the stage would have been excellent.Kudos to the Hershey Park staff: every interaction I had from parking attendants to security, t-shirt sales to ushers (yes, the still use them) was professional and courteous.